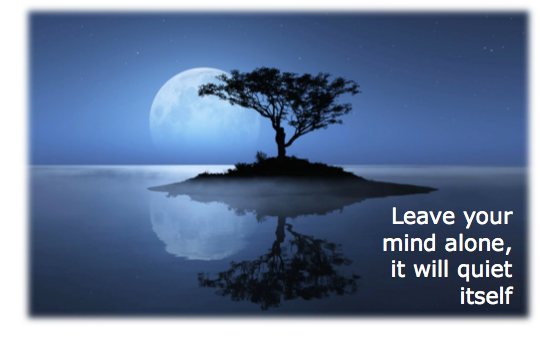 Your mind is like the surface of a beautiful pond. Your thoughts are like the wind. In the absence of thoughts the surface is a perfect reflection of the universe and it is hard to notice where the universe ends and the your mind starts. In the presence of the wind the surface is disturbed and the reflection now creates a distorted world. As long as we are human this is how we will experience the world. Life is however not about creating a perfect reflection, it is more about understanding and learn to live with ourselves, in all our innocent humaness. Most people would agree that they enjoy life best when their mind is quiet and peaceful. To be able to enjoy moments without hundreds of thoughts swirling around in your head seems like a paradise to those who walk around with a constantly revved up mind. To most of us a revved up mind means that life in the moment is fast, maybe a little bit hectic, chaotic and sometimes even stressful. And some of us may also say that being revved up, to live in high tempo, is pleasant but I believe that this suggests something completely different. For me it suggests that the pleasantness more likely comes from you being used to that way of life. To someone who is used to live in high tempo, a life without constantly being involved with optimising ones life situation or the events within it, can be almost intolerable. Is it possible to be addicted to a life style in high tempo? This idea is in fact no so far away from the truth. To be addicted to drugs or to a life style in high speed have similar characteristics. It might be so that a revved up mind releases something within us that humans can get addicted to. If this is true or not is not without relevance but still it is not important to the subject at matter. Why, well because it seems to me that most people deep down knows that a revved up mind produces very little quality in life. It rarely allows you to enjoy what you have or who you are. How can we appreciate and enjoy life here and now if we are constantly engaged and involved with arranging future events and situations in our minds? Does this behaviour qualify as insanity? To me it most certainly does, but more in a innocent manner. So what makes us continue this form of insanity and fail to see that it is in fact a form of insanity we are entertaining? The answer lies in the question you just read. We are unable to get out because we cannot clearly see what is going on. It is like sitting in prison without even knowing that you are in a prison. How can one escape a prison which one cannot see? Here are the bad news. To escape a prison you cannot see is probably close to impossible. But the good news is that there are more effective ways of escaping an invisible prison. You see, the only thing you need to do is to shift your focus and take a look at what is keeping you from seeing clearly. A clear mind sees clearly, a foggy mind does not see things clearly. A mind addicted to constantly being stimulated will do everything to get what it wants, more stuff to engage in. Unfortunately for us is that in its strive it will innocently keep up from seeing things clearly. Some would argue that we rarely use our minds at all, it uses us. If you somewhat recognise what I am speaking of I would encourage you to ask yourself this: Are you your mind? If not, then who are you? A couple of nights ago I was in a foul mood. If I recall correctly I was displeased with something and I didn’t like how I felt. When I am thinking about that night I think what I experienced was a mix of guilt, bad conscience, impatience and I even felt angry. Although my mind was contaminated with all this stuff and my sense of clarity was impaired I could see what was going on and when I saw it I got upset with myself for having a rough night. Isn’t the irony of this just lovely. Here I am, having a rough moment and what do I do about it? I beat myself up for getting upset about my poor state of mind. When I saw what was going on, I got even more upset because now I started to blame myself for not being able to take control of myself and be more resilient in tough times. By now you probably see how productive I was that evening 🙂 For me the interesting part however was that even though I felt totally absorbed in my own self-torture there was something within me that wouldn’t let me lose myself completely. And all of a sudden, in all my fogginess I heard “stop entertaining your mind”. On my intellectual level that sounded like a good plan but in all honesty I wanted to do the exact opposite. Instead of listening to that inner voice I rather wanted to reach for a book or indulge myself in watching some easygoing sitcom but there was something within me that made me hesitate. When I am writing this I recall one of my favourite pieces of wisdom “This too will pass…” and the truth of the temporary quality of everything in our world, our states of mind in particular. Recently I was having a conversation with a gentleman that shared a story about how a sudden insight in the middle of a big drama totally changed his perception. When I asked him how he could break free and regain his bearings from this award-winning drama, at least this is what it looked like to me, he said: “I suddenly remembered that somebody have been saying that my feelings are created from my thinking and in the middle of all the upset this is what I heard…my experience in this moment comes from my thinking…and all of the sudden I saw the meaning of this and in the next moment I was fine…the drama was gone”. No matter how good we are at spotting our own dramas, hidden traps or prisons our capability of spotting them relates on how conscious we are in the moment, on our state of mind. Fortunately for us, once we realise that a state of mind cannot keep its state by itself we understand that the rescue can be just around the next corner, one thought away. This has been my preference of reference for a while now and it has saved we from drowning in my own crap countless of times. I know now that my thoughts cannot be trusted nor serve as a good foundation for important decision making when I am in a low mood. Although the latter is a well known and sensible advice I doubt that people actually are able to follow it. For me it was not until late in life I realised how to apply this when I had my low moods. This is what some has called as the big cosmic joke, that when we need our clarity the most is when we have the least access to it. An interesting question which I never asked in my conversation with the gentleman was to take a closer look at and explore what he thought about the experience of being lost in a drama and from nowhere come to his senses. If I remember it I will ask him the next time we get a chance to talk. Take care and good luck with your exploration of life.